Hi everyone! It’s been really amazing to finally be able to “give birth” to this new EP, it’s the bilingual project I’ve been working on. Below’s the event invite, please feel free to share! Digital Release: 15th April 2015 at http://sarahchengdewinne.bandcamp.com. Note: all tickets also include a drink. 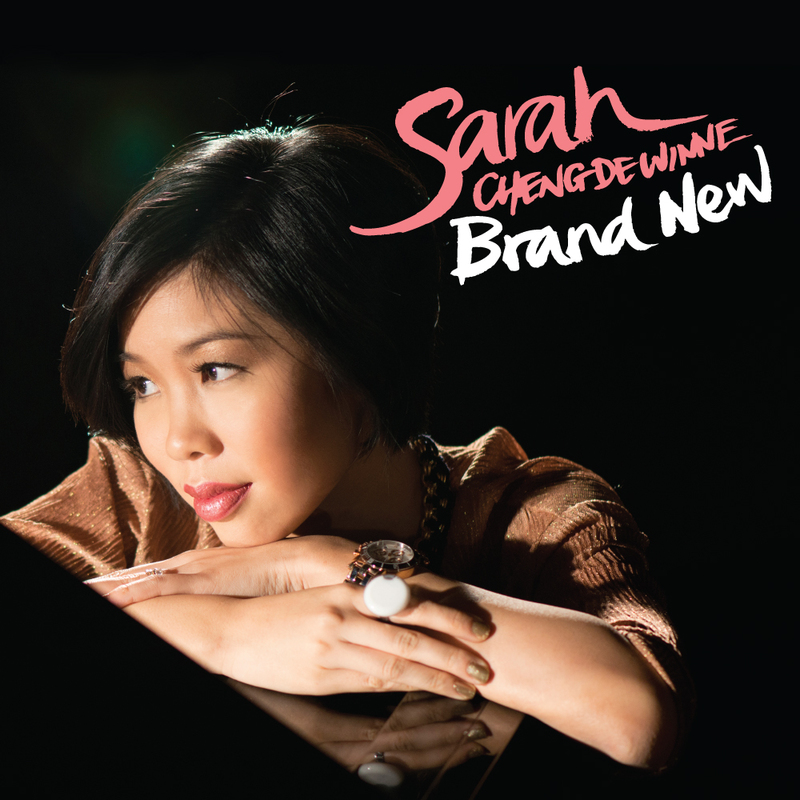 13 Apr 2015, Singapore — Burning with a passion to inspire with a message of supernatural hope, CANDLE is the latest musical offering from soul-pop singer-songwriter Sarah Cheng-De Winne. CANDLE will be released digitally on 15th April 2015 and physical copies will be available at the launch showcase on 9th May 2015. …lit to produce light as it burns. Witness the launch of CANDLE, the latest musical offering from award-winning singer-songwriter Sarah Cheng-De Winne. With bilingual songs of light and love, the evening promises to inspire listeners with expressive songwriting, stories of newfound hope and Sarah’s “delightfully soulful voice”. 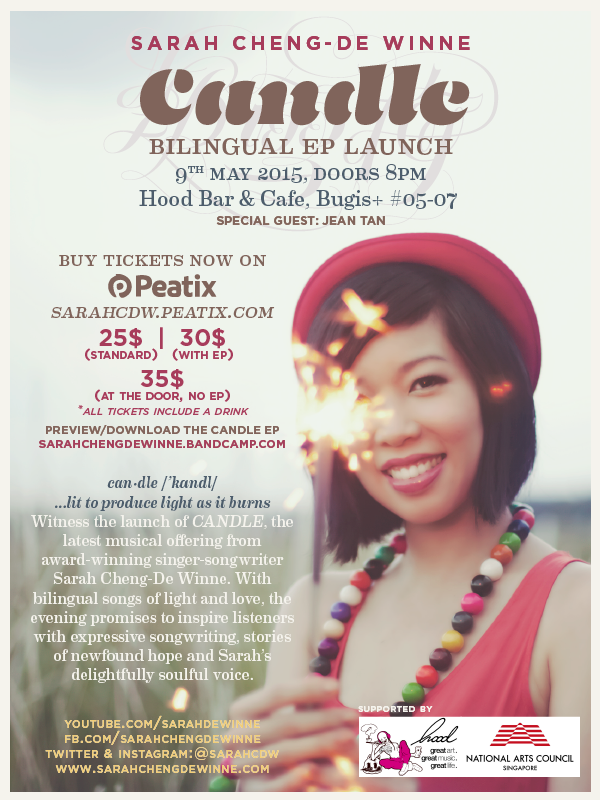 Made possible with an Indiegogo crowd-funding campaign and grant support from the National Arts Council and COMPASS, Sarah Cheng-De Winne’s latest soul-pop offering explores themes of light and love with a long-awaited 4-track bilingual EP. 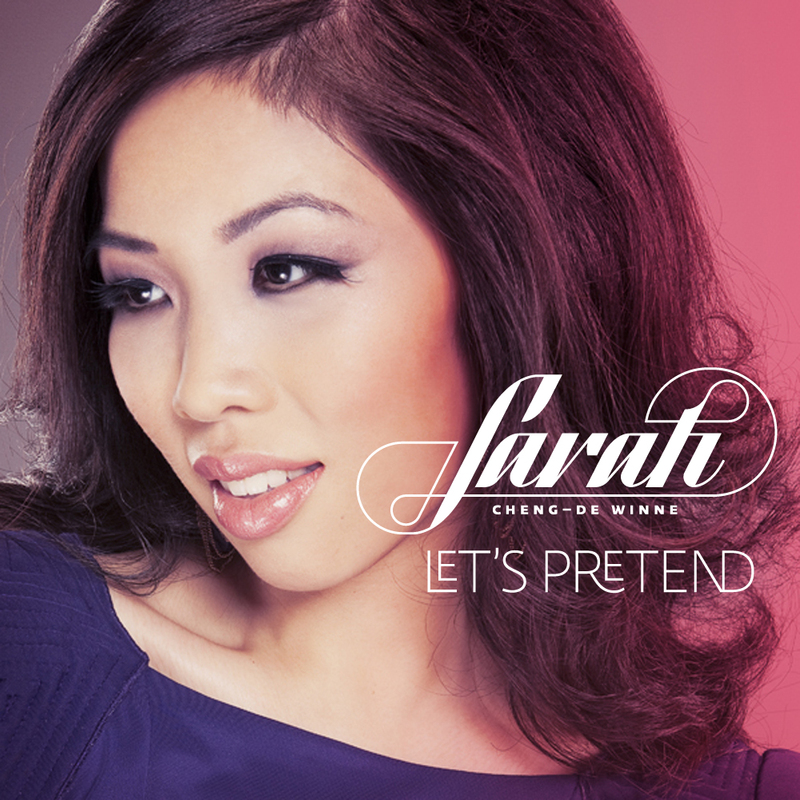 Collaborating again with producer Kavin Hoo (Corrinne May, Tanya Chua), the title track, “Candle” is an energetic indie-pop number that uplifts with its anthemic, driving melody; while second English single, “To Where You Are” takes you on a soul journey with Sarah’s lush harmonies and deep, laid-back grooves. Best known for her “chocolate velvet vocals”, Sarah extends her signature R&B-infused sound to include collaborations with Paula Ma Yu Fen (马玉芬), Taiwan’s most sought-after vocal producer, and Chinese lyric powerhouse Zhang Si’er (JJ Lin, Harlem Yu), to create R&B ballad 爱的恩典 Ai De En Dian (The Grace of Love), a song Sarah wrote to express the depth of a grandmother’s love. Desiring to express herself authentically as a songwriter, CANDLE also sees Sarah co-writing the Mandarin lyrics on the song 我需要你 Wo Xu Yao Ni (I Need You), an edgy soul-pop number that celebrates finding new life and love. She believes this is an inevitable part of her journey towards becoming a truly bilingual singer-songwriter. Written, recorded and produced over a period of extensive touring in Taiwan and China with international music production from Los Angeles, Taiwan and Singapore, CANDLE is the culmination of Sarah’s passion to inspire the next generation of changemakers with her unique brand of music for the soul. I refer to the The Straits Times article, “$348k boost for home-grown music” (Sunday, 18 Jan 2015). As Yahoo Singapore has reported, the creation of a Sing50 music fund that has an initial $348,000 to promote homegrown music has drawn flak from various stakeholders in the music and media communities. Furthermore, the first initiative the fund will take, the acquisition of 50 Steinway-designed Lang Lang Pianos for a Sing50 concert (See AsiaOne report), seems to be a slap in the face of many independent musicians in contemporary rather than classical music — who have been working hard at garnering funding, gaining the right type of exposure, and seeking larger local and overseas audiences for their original music. While the above statement seems to have the right intent, it has not resulted in an initiative that understands that local heritage is firstly built on a pride for music produced by independent contemporary homegrown artists, not just commissioned songs produced for National Day celebrations, traditional songs like “Rasa Sayang”, and already mass-exposed works of established Singaporean music figures. As the growth and promotion of homegrown music lies very close to my heart, I could not help but think of a few ways that the government and the management of the Sing50 fund could explore to truly promote the growth of a healthy music culture in Singapore. I do hope that the managers of the Sing50 music fund will take some of these into deep consideration. 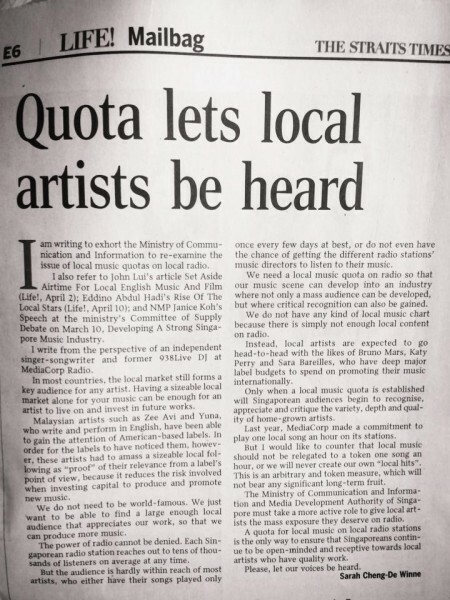 I have written letters to both The Straits Times and MDA on this topic before (Quota Lets Local Music Be Heard — read full-length letter here). However, there does not seem to be any interest from MDA to relook this issue in the near future. This is not merely a funding issue, but a deeper policy and ideological issue that must be addressed from the leadership of MDA, NAC and any other stakeholders in the government and civil society who are truly interested in the growth of local music culture — culture which leads to heritage creation. Gentle Bones has captured the imagination of the youth audience and deserves wider mass exposure on mainstream television. The Sing50 fund could also be used to subsidize commercial prime airtime for television broadcast of contemporary homegrown music videos of high local interest. 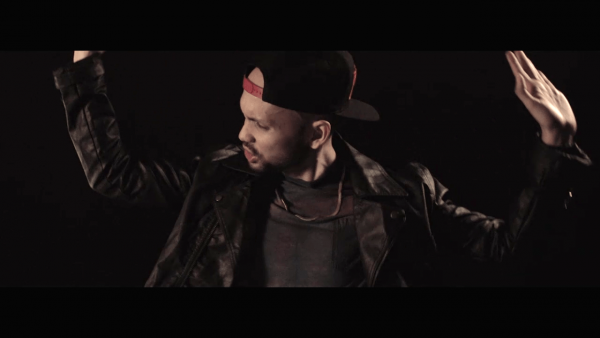 Think Gentle Bones: in my humble opinion, his work deserves mass exposure after already garnering a large youth audience through strategic Youtube marketing. The youth make up the most active music-seeking segment of our society. Yet, due to our globalized media, high internet penetration rates and lack of exposure to homegrown music (itself due to many factors, including lack of frequent radio play of contemporary homegrown music — see Point 1), most of our Singaporean youth consume Western-produced music, Korean-produced music or Taiwanese-produced music (depending on which language) most of the time compared to consuming local music. It is essential for homegrown artists to therefore have the opportunity to build communities among the youth through live performances to large audiences. And what better place than schools? Schools could host once a month or once a quarter showcases of homegrown contemporary music artists as part of this music education. Local indie music manager Willie Tan from Invasion.sg / Aging Youth used to and are still working on creating such School Invasion tours, but they can only focus on only bringing a limited number of artists to a limited number of schools each time given their limited resources. 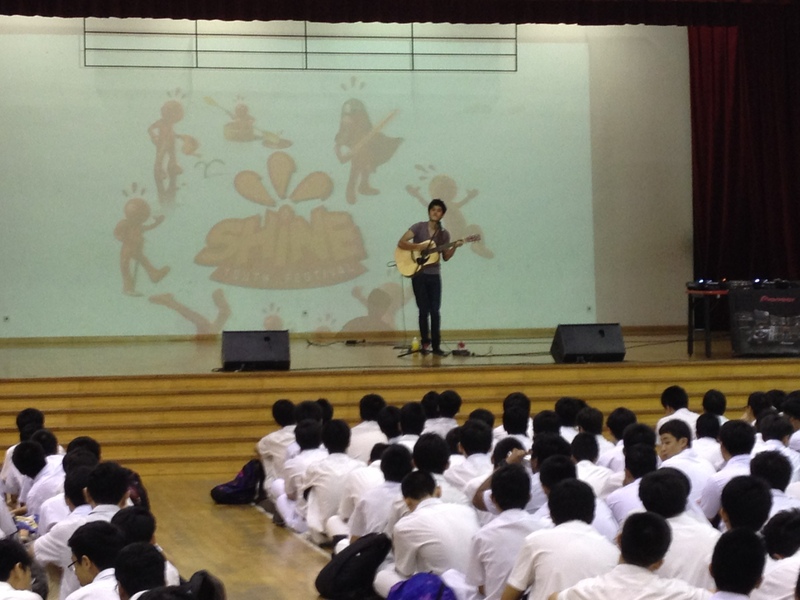 With substantial funding from something like the Sing50 music fund, School Invasion Tour model could be studied and replicated on a much larger scale, with a team of full-time staff that should be hired to sustain this program for at least 5 years to grow the culture and youth audiences sensitivity and inclination for homegrown music. The Sing50 music fund should be used to highlight heros of our contemporary music culture, who can be traced all the way back to Singapore’s earliest days. Music veterans Ann Hussein and Kuo Po have personally shared with me that in the 70s and 80s, there was a flourish of many bands that did not conform to a single music style but worked in a variety of music styles from Country, Rock and Pop to Soul, Jazz and R&B. Where is this missing heritage of independent music, and how are we continuing to create new contemporary music for our time? We need filmmakers and historians to come together to document and share the extremely rich heritage we come from, and continue to document contemporary artists. 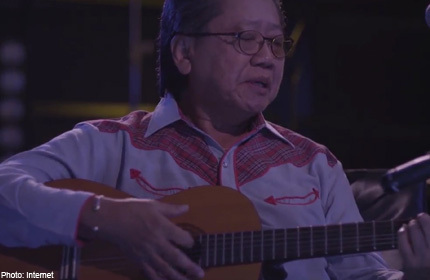 One example of an extremely well-produced documentary is Singapore Country by Wee Li Lin, which features the journey of local country music pioneer Matthew Tan (of Matthew Tan and the Mandarins). Contrary to our counterparts in Canada, Korea and Taiwan, Singapore does not have a regular, official festival presence in major music festivals such as SXSW, Canadian Music Week and Glastonbury Contemporary Arts Festival. To take Taiwan as an example, they aggressively promote and select suitable music acts to showcase at international platforms. One such artist who has benefited greatly from such initiatives is Joanna Wang, whose eclectic original music has found overseas supporters through her exposure on platforms like CMJ Music Marathon in New York and Glastonbury Music Festival. The Sing50 fund should set aside a budget to make a sustained presence at these international festivals with a Singapore pavilion, with at least for a commitment of 5-10 years. 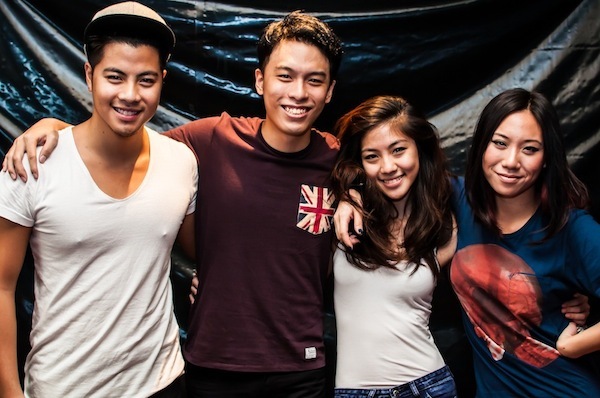 The Sam Willows have been building consistent momentum since their North American Tour in 2013. Our homegrown acts definitely have the talent and content to be showcased. 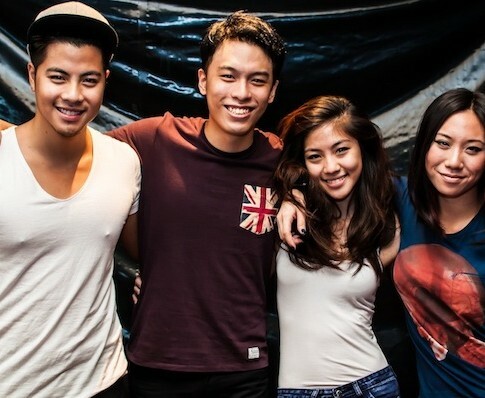 As examples, The Sam Willows broke ground at SXSW and CMW in 2013, while last year’s signing of Miguel Antonio and Kevin Lester by Apl de Ap’s BMBX Entertainment highlight the interest of international-level producers who desire to work with Singaporean talents and help them go the next mile. JJ Lin, who has been in the industry for more than a decade, finally received recognition as Best Male Artist at the Golden Melody Awards in 2014, the equivalent of the Grammys in the Chinese music world. For new pop artists to truly emerge from Singapore, on the level of Corrinne May, JJ Lin, Stefanie Sun and Tanya Chua — artists who can really make a difference on the regional and international level, large amounts of mentorship, funding and music business resources to push our deserving talents to the next level. It’s been at least a decade since our last major pop artist broke out on a regional level, and it’s about time for a new generation to rise up — but this generation needs financial resources, teams, network and infrastructure. Therefore, in the same way charitable organizations offer double-tax rebates on donations to their donors, the government should consider creating an incentive for corporate sponsors and donors to have a vested part in giving back to society — through funding the creation and promotion of homegrown music through direct donations to independent artists or any of the previous points mentioned above. Furthermore, the Sing50 music fund should also directly contribute towards artists who are able to garner independent funding and pass certain assessment criteria. I would suggest a 1-for-1 fund matching system so that artists can boost the funds available for production, promotion and hiring of staff. Currently, there are no such funds available to independent music artists who desire to create and promote quality content on a regular basis, much less take their music to the masses on a regional level. 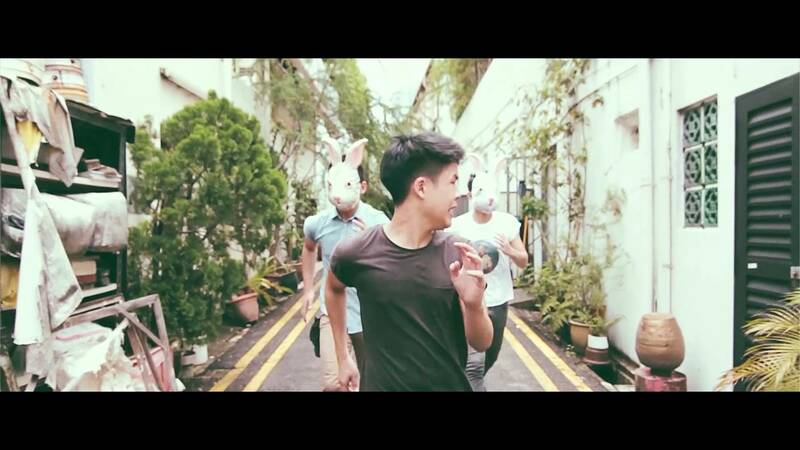 In a small nutshell: together with the production of high quality and diverse contemporary music for our own audiences, we must note the importance of exposing our own contemporary homegrown independent artists to Singaporean youths and the masses both locally and overseas. Together as a music community, surely we can find new and creative ways to use generous funding that these patrons have come forward with, if the lovely folks in the government and the Sing50 music fund are interested to engage various stakeholders and actual independent musicians in dialogue. 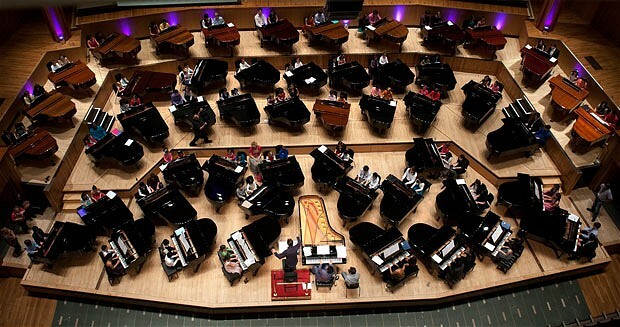 Sadly, donating 50 Steinway-designed Lang Lang pianos to schools can hardly be considered a sustainable or deep-impact initiative to spend SGD1.3 million on. I do hope that future initiatives will take into account the deep passion that we independent homegrown music artists have for our nation and our desire to make a real difference. As a performer, it’s never easy to keep that balance between artist image and “real life” – but Stef has been adept at being humble about her non-stage appearances throughout her career, mentioning that she prefers not to wear makeup when she’s not on stage. But going beyond just not wearing makeup, it is in the attitude of being willing to be at the level of an “ordinary person” rather than “keep up appearances”, that we applaud and respect. Being humble, is being wise. She chose not to ignore the criticism, but to admit that it was indeed her. After choosing to respond, her next choice would be, how do I respond? And she chose to join the fray in an almost a self-depreciating manner, to show that she too could criticise herself! Classic case of “if you can’t beat them, join them”! 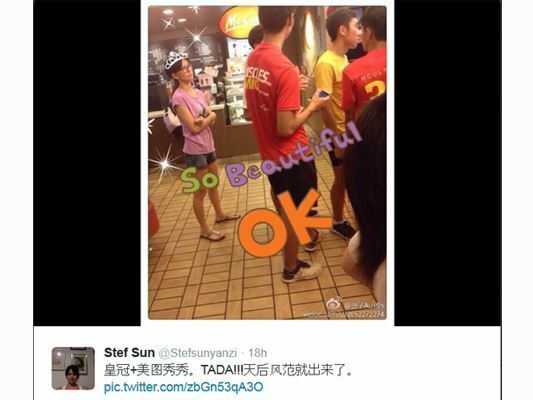 Her words “So Beautiful OK” could have been a sarcastic comment overlaid on the image, created by anyone else as a poke at Stef’s Mandopop queen image. But because she chose to create the image herself, she put herself on the same team, on the same side as her critics! And how could you bear to further criticize someone if they are already with you on it? 3. Don’t Be Afraid to Redeem Yourself… and Have a Sense of Humour too! Criticism comes, and even after you admit that you were what they say you were… Stef’s redeeming point was that she took a swift and decisive action to humour both herself and the social media “beautifying” apps that are currently rampant practice. Her post implies, “hey, even a star like me needs the help of these apps to be beautified too”, but then, in her accompanying tweet, she jokes that the flavour of her queenly style (天后风范) comes back – meaning that she knows her true place and is confident enough to assert it! But because she does it through the very same mediums that the first and original photo was propagated, she creates humour and goodwill for all involved in the situation, including herself. Yes Stef! You are our Queen of Hearts, and we love you for who you are! True Beauty comes from the inner light you have, not from outwards appearances. 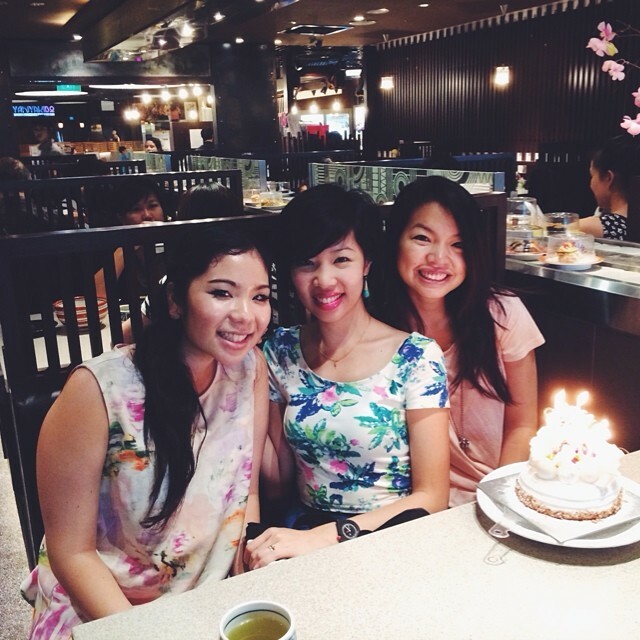 I wanted to share some thoughts on the most beautiful women I know, and why I think they are. One of my friends is a very successful business woman and has built up a very strong social media following at the same time. After meeting her recently, I realise that her quiet yet confident attitude was one of the most attractive features about her. Of course, she shines with a radiant physical beauty too… but her genuine character and quiet confidence encouraged me to examine my own attitude towards life: can I be confident yet humbly quiet at the same time? Very often, we overlook the importance of smiling in all situations. A waiter makes a mistake on your order. What’s more attractive: getting angry with him while demanding to speak to the manager, or smiling to say, I forgive you, but could you make it right for us please? Very often I have been quick to anger instead of being quick to smile! I am making a conscious effort now to smile first before saying anything… regardless of the negativity of the situation. Smiling makes you much more approachable, less threatening… and simply, someone that other really want to help and get to know better. The most selfless woman I know, happens to be my grandmother. She is someone who cooks with a cheerful and loving heart the favourite dishes of all her children and grandchildren, has a never-ending supply of Yakult in her fridge (because she knows we all love drinking Yakult), takes the time to visit us even though she is getting less and less mobile as she ages, and calls every week to check if we’re alright. When we’re at her house she’s never without a most beautiful smile, and always ready to hear about what we’ve been up to, never at once imposing her own needs and activities on us. Whatever little she has in her small apartment, is also ours, and she simply gives. One other woman I know happens to be another businesswoman who never fails to continue to innovate her businesses in the face of adversity and change. Adversity is always going to be a part of life, but how we face it and move on from it shows our real strength of character. My own mother also runs her own firm and faces many challenges from dealing with clients to HR issues and even managing conflict. I have learnt also that true strength is drawing from the inner joy that one can find through God’s strength, and not our own. Resting in God’s power and soaking up His divine joy will allow us to have strength to go through any trial. For many years I used to struggle with my own character flaws, and believed in the lie that I could never change. However, I recently was encouraged by a friend of mine, who said he has noticed changes in the way I approach projects and people, which really surprised me, because I was not aware of this. I hope this encourages you that if someone like me can make a change, you too, can make a change! What is True Beauty to you? 🙂 Leave a comment below or tweet me at @sarahcdw. Singapore — 4 years since her debut and 3 recording projects later, 26-year old singer-songwriter and ex-938LIVE Radio DJ Sarah Cheng-De Winne is longing to share her latest music with the world. But instead of waiting till the EP is completed, Sarah is organising a Listening Party on 29th July 2014 for her forthcoming bilingual EP, CANDLE, to share her recording progress and launch a crowdfunding campaign with her fans on Indiegogo’s online platform, which goes live on 30th July, 2014 at http://igg.me/at/sarahchengdewinne. CANDLE, her latest recording project, will consist of 6 new songs in a mix of Mandarin, English, and songs with dual language versions. 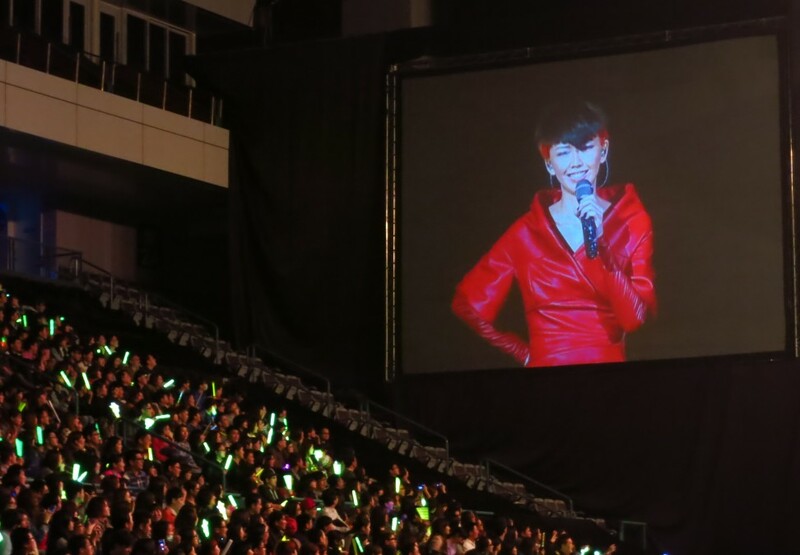 In a bid to perfect her recording techniques in Mandarin, Sarah recorded CANDLE’s two Mandarin-only tracks in Taipei with renowned vocal producer Paula Ma 馬玉芬, who is best known for producing A-mei’s hit, “听海” (“Ting Hai”). Sarah’s crowdfunding goal of SGD20,000 is part of a larger fundraising campaign to raise SGD75,000 in order to fund CANDLE’s production, first round of promotion and cost of touring in China. Through Indiegogo, contributors can donate varying amounts that correlate to tiered “perks”. These range from pre-release downloads of Sarah’s music, one-of-a-kind artwork created inspired by songs from CANDLE, to T-shirts specially designed by Mark De Winne, Sarah’s husband and Creative Director of Relay Room. The road to being a bilingual artist has not been easy. But after Sarah was exposed to the potential of the Chinese music industry in Shanghai, she sought out JJ Lin’s previous lyricist Zhang Si’er and produced 《要你的愛》 (Yao Ni De Ai), a six-track EP consisting Mandarin versions of her songs from Brand New (2012). Armed with this new work, Sarah toured Taipei intensely from February to May 2014 with a series of live performances. Simultaneously, she began producing Mandarin YouTube videos as part of David Choi’s 25-Video Youtube Challenge to her, steadily garnering Taiwanese fans with her unique brand of positive, soul-infused pop.